Kasetsart University is a public university in Thailand and a top-ranked Public University in Thailand. It is ranked No.401-500 in the world by QS. It was also the first agricultural university and the third oldest university in Thailand. The university was established on February 2, 1943, with the primary aims in promoting subjects related to agricultural science. To the present, Kasetsart University has revised its curricula and expanded the subject areas to cover science, arts, social sciences, humanities, education, engineering, and architecture. Recently, the university made an attempt to include medicine and health science. Kasetsart University has seven campuses throughout Thailand, where its main and flagship campus is at Bang Khen, Bangkok. The total enrollment at Kasetsart University is over 58,000, placing it among the top largest universities in Thailand. The establishment of Kasetsart University was part of the evolution of agricultural education in the country which began with the founding of a system of technical schools. This era may be divided into three periods. Western-styled agricultural education in Thailand began with the establishment in 1904 of the School of Sericulture or Rong-Rian Chang Mai (โรงเรียนช่างไหม) in Tambon Thung Saladaeng, Bangkok, offering a two-year program entirely in sericulture. In 1906, the program was extended to three years and included cultivation of other crops and veterinary science, and the name was changed to the School of Agriculture or Rong-Rian Vicha Karn Porh Pluke (โรงเรียนวิชาการเพาะปลูก). In 1908, the School was merged with the School of Surveying, the School of Irrigation by the Ministry of Agriculture in order to train personnel to serve in the Ministry. The school was re-named the School of the Ministry of Agriculture and Thailand’s first tertiary-level agriculture curriculum was drawn up and was inaugurated in 1909. The school was merged with the Civil Service School in 1913 by the Government of Siam and was placed under the Ministry of Public Instruction and Religion. During this time, the Primary School Agriculture Teacher Training School was established and offered a two-year higher education program awarding a certificate in primary school agricultural education. The school was initially located in Bangkok but was moved to Nakhon Pathom province in 1918. In 1924, the Primary School Agriculture Teacher Training School was moved to Prachuap Khiri Khan Province and a second branch of the School was established in Saraburi Province in 1926. At this time, agricultural education at both primary and secondary school levels were provided through various technical schools. In 1931, Siam’s agricultural education was back in the hands of the Ministry of Agriculture as upcountry agricultural research stations and teacher training schools were planned to be set up in concert. In 1933, the Mae Jo Primary School Agriculture Teacher Training School was established in Chiang Mai Province. 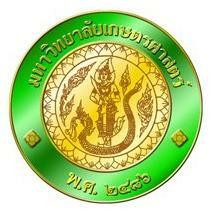 The School is now known as Mae Jo University, Kasetsart’s sister university that bears the same insignia. In 1935, as the number of agriculture teachers exceeded the demand, the government planned to close down three news primary agriculture teacher training schools, one of which was Mae Jo, the three founding fathers of Kasetsart, namely Luang Ingkhasikasikan, Luang Suwan Vajokkasikij, and Phra Chuangkasetsinlapakan together proposed a project whereby the Mae Jo school was retained as a secondary-level agriculture technical school. This was later elevated to become the College of Agriculture, with the status of a division in the Department of Agriculture and Fisheries. In 1938, the Ministry of Agriculture established the Central Agriculture Station, or Kaset Klang in Bang Khen District of Bangkok, and the College of Agriculture was moved down from Chiang Mai to Bangkok as well. The College offered three-year certificate programs in agriculture, cooperative science, and forestry. On February 2, 1943, Kasetsart University (มหาวิทยาลัยเกษตรศาสตร์), translated as the “University of Agriculture”, was founded by the Kasetsart University Act of 1943. Although the name may suggest accordingly, the university offers many excellent programs considered among the top in the country including agriculture, agro-industry, forestry, fishery and engineering. Kasetsart University is a university known internationally for academic excellence and work of world standard. It is a prime mover in mustering intellectual resources to help the nation achieve sustainable development and negotiating power in the world community. Task Kasetsart University gathers wisdom and knowledge, creates and develops varied bodies of knowledge, and forms people who are intelligent, who think rationally, who behave morally, who are conscious of the common good, and who produce high standard work capable of competing in the world market. The university manages its resources efficiently, joins in the development of the community, and is responsible to society so as to serve as an important instrument in ensuring the well being and security of the country. Kasetsart University devote itself to the task of accumulating and developing intellectual knowledge. It thrives for the growth in academic wisdom including ethical and moral excellence. In addition, it has a responsibility to play a leading role in keeping our Thai heritage alive and to ensure that it continues to grow to enrich the civilization of the notion.